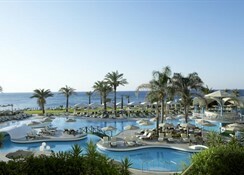 Rodos Palladium is Rhodes' most awarded 5-star family friendly beachfront hotel located on the Kallithea beach. 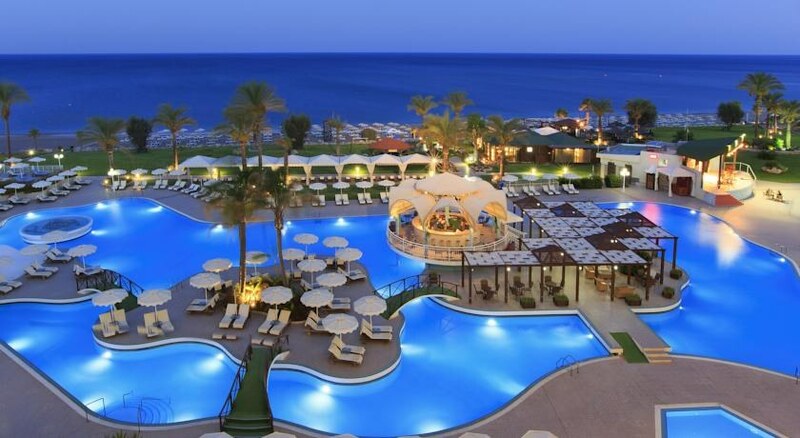 Just 9km away from historic Rhodes town this is a relaxing resort boasting of grand swimming pools, three lovely restaurants and a well-appointed spa. The hotel’s spacious guestrooms offer a relaxed, comfortable accommodation and panoramic sea views and come with Individually controlled central air conditioning, Wi-Fi Internet Access (free of charge), Satellite LCD TV / Radio channels, Direct dial telephone, Fridge (Mini-Bar on request), Mini kettle, Safe deposit box (free of charge), Writing desk and a marble bathroom with bathtub, Hairdryer, Make-up magnifying mirror and Slippers. The hotel is 14km from the Rhodes International Airport. The luxury Rodos Palladium Leisure & Wellness is set on 7.4 acres on the blue flag awarded beach of Kallithea and next to the Kallithea Springs picturesque monument. The nearby resort of Faliraki is 5km to the north. The nearest airfield, Rhodes International Airport is 14 km away. The hotel’s spacious guestrooms offer a relaxed, comfortable accommodation and panoramic sea views and come with Individually controlled central air conditioning, Wi-Fi Internet Access (free of charge), Satellite LCD TV / Radio channels, Direct dial telephone, Fridge (Mini-Bar on request), kettle, Safe deposit box (free of charge),Writing desk and a marble bathroom with bathtub ,WC, Hairdryer, Make-up magnifying mirror and Slippers. Renovated in 2018, these come in Deluxe, Superior Deluxe, Family and Family Superior types. Rodos Palladium Leisure & Wellness has a clutch of excellent bars and restaurants to cater to the palate of guests. The Symposium Restaurant is a buffet restaurant that serves Greek and Mediterranean cuisine. 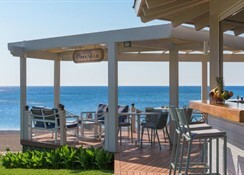 The Thalassa Restaurant serves delicious Greek, Mediterranean, Seafood, Local, International and Grill/BBQ in a la carte style. There is the Poseidon Beach Snack Bar which serves Greek, Mediterranean, International dishes along with drinks. Kid meals and special diet menus can be ordered on request. Rodos Palladium Leisure & Wellness has four swimming pools and kids’ pool and terrace besides access to the private beach. There is Yoga classes and a fully equipped gym for those who wish to stay active. There is a lovely spa with steam room offering massages and therapies. Tiny tots can have fun at Kid’s Club or Playground. 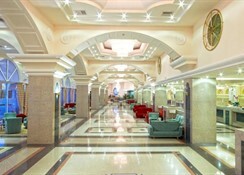 The hotel has facilities for Darts, Table tennis, Tennis and Billiards. Guests can also shop at the shops on-site. There is lively evening entertainment and a nightclub too. Cooking classes are offered.